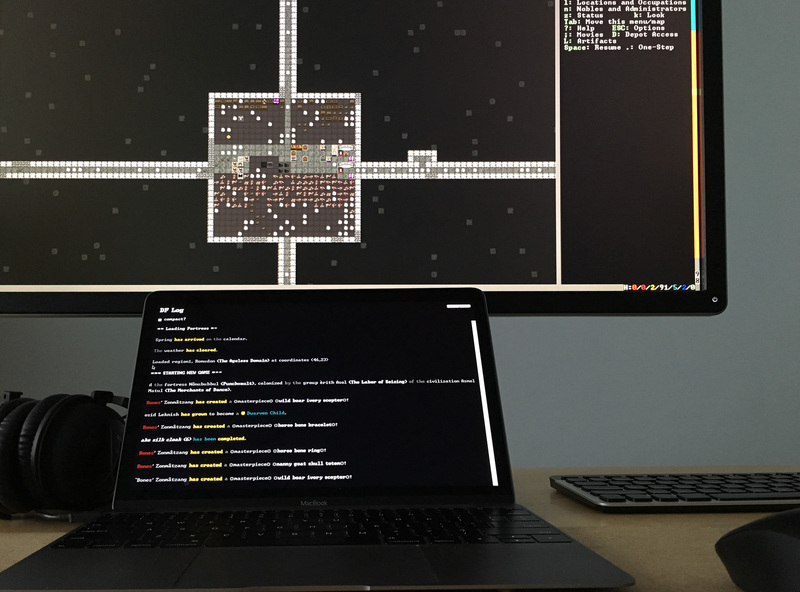 The pack without DFHack is on Dwarf Fortress v0.44.09 now. I didn't test it much, though. updated Taffer to 5.1.2. It includes the long-anticipated Damascus tilesheet which has really cool walls. A bunch of less popular graphics packs were removed to simplify the options. Let me know if you miss any. The 32-bit lite pack is in the legacy section now. 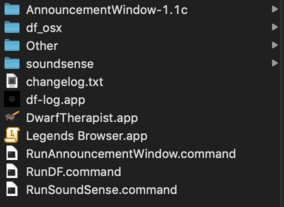 Snow Leopard, Lion, and Mountain Lion users who need Dwarf Therapist will want to get the 32-bit lite version from the legacy spoiler. Barebones pack is replaced with a 64-bit lite pack that includes Clément's 64-bit Dwarf Therapist. Any news for 0.44.12? The TWBT was supposedly fixed in DFHack 0.44.10-r2. You can upgrade the DFHack bundle now. “dfhack” can’t be opened because Sandbox is not allowed to open documents in Terminal. Just downloaded Lazy Mac Pack v0.44.05 dfhack-r2 on a mid-2015 Macbook Pro running 10.13.6 (High Sierra), connected to a Thunderbolt 2 Display. Opened Lazy Mac Pack successfully, did my standard tweaks, hit Play. Tried to run individual programs, was told I needed the latest JDK. Downloaded that, which let me run SoundSense. Still had to open the other utilities manually using right-click at least once. Trying to open dwarfort.exe somehow opened up PlayOnMac (??). Googling the error code hasn't yielded any results, so I figured I would post the whole thing here. Any help would be appreciated. Edit: general Googling the error code, minus the specific file name, suggests that this problem may be a variant of the known quarantine issue, with the problem being that it's throwing the error code inside Terminal, which fails differently than trying to open packaged files through Desktop. I've started running into a problem that I had with the previous version of LMC that I used where I get frequent crashes. It's usually when i'm editing the dwarves' labors (in game, not with Dwarf Therapist) or when I view them from the Units screen. jecowa, any updates? All the DFHack and TWBT bugs have been fixed upstream. While jecowa is out, I made this. It's not a replacement for Lazy Mac Pack, it doesn't have a launcher, it doesn't have options, and it comes preconfigured. Let's call it MacPack 0.44.12-p0. Everything comes preconfigured to work together and ready to play. Save file is included so you can check out how the game looks right away. If you have a Retina display, open df_osx/data/init/init.txt and adjust it to match resolution of your screen. [GRAPHICS_FULLSCREENY:2160]Press Alt-Enter in game to enter fullscreen mode and play in full resolution. Text will be huge at first, but don't panic. - hold CMD to adjust map zoom level. You can also do it by "Ctrl +" / "Ctrl -"
Sometimes (rarely) multiscroll stops working (long standing bug which I can't reproduce). Press Ctrl-Alt-Z, Ctrl+Z to reload it. You cannot Cmd-Tab out of fullscreen DF, so you have to Alt-Enter again first. If you have more than one screen, you can use another full screen app alongside with fullscreen DF. Alternatively, you can use included RDM.app to set your whole screen to real (not HiDPI) resolution and play full res DF in a window. - added all 44.12 keybinds to the mac-optimized interface.txt that comes with Lazy Mac Pack. Now interface.txt is sorted in alphabetical order to make future updates (with diff) easier. Script to sort keybinds is in the /init/ folder. ...and remember to press Alt-F1 on any screen to see all dfhack shortcuts! - silenced sparring by extending on this reddit post. Ideally someone should make a new unobtrusive collection of sounds for sparring, so it could still be heard but not mistaken for combat. - updated filters.txt, they weren't matching a lot of stuff from 44.12. Now it works great! - tried to fix a bug where menu gets disabled after first usage. I just commented out the code that conditionally disables menu. It still happens but not as often. - it's recommended to disable "check for updates" in Therapist options. 41.0.3 fixes windows-only bug, this build doesn't exist for Mac OS, but Therapist still detects it, asking for update and re-downloading memory layout on every reconnect. This is still happening? I thought it was fixed in v40.0.0 (see issue). Why not include the launcher? The binary is compatible with all newer versions, and was designed to provide a unified interface to Dwarf Fortress until Toady bothers. You should just need to tweak the json file and update the Baselines and Defaults. Also your Retina modification should be unnecessary. Use Mifki's SDL build instead (http://www.bay12games.com/dwarves/mantisbt/view.php?id=9762), it fixes everything on the jecowa's dfhack pack. I'll see if I can strip the launcher out of LMP. Can you upload a full res screenshot of DF zoomed out in fullscreen with mifki's SDL on imgur? Last time I checked, it wasn't using real resolution when using a window widget, and was crashing when using "Alt-Enter", you can see it discussed earlier in the thread. I't just a fancy fullscreen 2x upscale. That's why it wasn't included in the LMP. I'll try it again when I get home. Regarding mifki's SDL - nothing changed since last time. Window widget -> fullscreen 2x upscale (not retina). Alt-Enter - misaligned fullscreen retina. Alt-Enter again (exit fullscreen) - crash. Bundled (Toady's) SDL can enter correct 2x fullscreen mode (just like mifki's SDL) after two consecutive screen widget clicks, and it's not crashing when using retina mode. I also can't confirm black rectangle issue you describe on Mantis. Update: blank rectangle appeared after several consecutive switches to and out of 2x upscale fullscreen. If it isn't too much to ask - and if it is feel free not to respond - is there anyway to get this without Meph's tileset? is there anyway to get this without Meph's tileset? I'll try to integrate launcher from LNP into the next release, which will happen in a couple of days, so it will be possible to choose between ASCII and tilesets. Any suggestions on which ones I should include? I know that CLA is good, but other than that I'm out of the loop. I don't think it's a good idea to include any non-ascii tilesets which weren't updated to take advantage of twbt. This is the case where "more choice is always better" does not apply. Player who doesn't have deep knowledge about the state of tilesets will think that it's just a matter of personal preference, because modern tilesets and outdated tilesets look more or less equally good on the post-embark screen if you don't know what to look for, but not all tilesets are made equal. In reality, player unknowingly choosing few hundred tiles at best vs thousands, not getting custom overrides, multilayering, multi tile objects, material color, transparency etc, which will result in a sub-par gaming experience. This is a ramp filled with lava 1 z-level below, rendered through a grate with correct material color. This is how everything should look. For me, ideal pack is a pre-configured, heavily tested and polished package that gives the best DF experience possible in 2019 from the get go. That means that most choices are made for the player by maintainer, which is ideal for someone who tries DF for the first time, and for most returning players. It also means limiting player choice to the things that are guaranteed to work great, leaving out all outdated stuff etc. I cringe when I see another youtuber playing with horrible settings because he gave up on trying to configure it like he wanted to. It's in Russian, and it's called "Good reasons to stop playing DF". It's from a dedicated df letsplayer and author/maintainer or Russian DF guides. He explains why he quit. From the start you can see him playing with a terrible square font. He complains about wanting bigger tiles, which come at a price of menu taking half the screen space. Pack comes with preconfigured twbt with curses_vector_48x72.png and clear instructions on how to adjust zoom level for tiles and text independently. He says that Soundsense played lots on annoying beeps. It did for me too. I fixed that. He complains about sparring in Soundsense sounding like combat, and missing a real combat that ended up escalating to a massacre with 40 dead dwarves because of that. I silenced all sparring, although I'd like to make it audible again, but with a set of less obtrusive sounds that could not be mistaken for combat. I don't have such sounds, help will be appreciated. He says that Soundsense played wrong sounds for new emotions. I fixed that. He complains about cancelation spam. AnnouncementWindow provides a great solution. It took some time to get it working with 44.12, but now it's great. He complains about bins, micromanagement and fps death. Well, nothing I can do. In the end he reiterates that he quit mostly of frustration from spending entire week on trying to make DF playable in terms of tileset size vs text size, and failing. At 21:00 he shows that he uses Lazy Newb Pack but it is still not working. My personal preference is Mayday. I'm a casual DF player and I think my taste is probably different from a lot of players. Meph's tileset has too many dark colors and when you play as zoomed out as I do everything starts to wash and details are lost. Edit: I just realized that I hadn't read your entire post. I know this is going to sound ridiculous - but I prefer playing with a sub-optimal visuals if those visuals are the right aesthetic for me. Sure there is a threshold where poor custom overrides and broken material colors would ruin gameplay for me, but I'm ok being blissfully unaware of how good DF COULD be visually. I don't mean to be disrespectful though - you're the master. I forced myself to learn how to play this game and read ascii. I can force myself to use which ever maximized tilesets you pick! 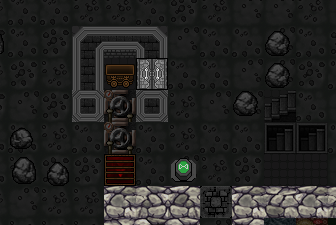 I've been playing with Meph's tileset. I love it - it's great. I changed up some settings on my monitor to work better with it. Sorry for the slight delay. No launcher yet. Press Alt-Enter in game to enter fullscreen mode and play in full resolution. Text will be huge at first, but don't panic. Sometimes (rarely) multiscroll stops working (long standing bug). Press Ctrl-Alt-Z, Ctrl+Z to reload it. - animations for ores and gems. Ores glow, gems glitter. 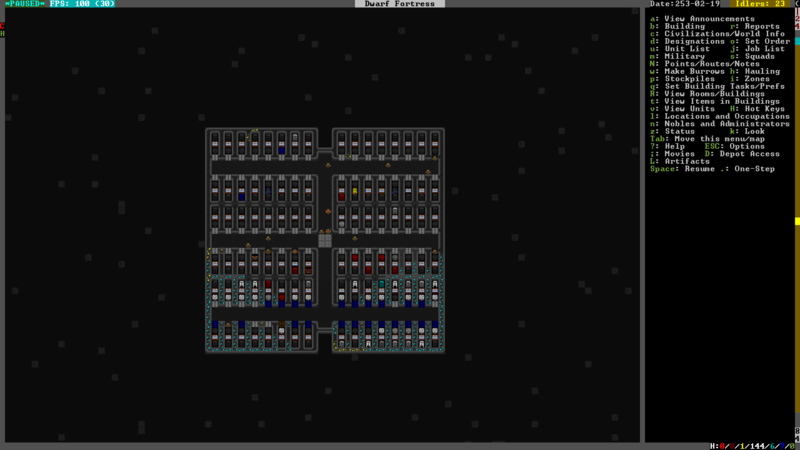 - silenced sparring by extending on this reddit post https://www.reddit.com/r/dwarffortress/comments/4lobqh/soundsense_sparring_sounds_off/ Ideally someone should make a new unobtrusive collection of sounds for sparring, so it could still be heard but not mistaken for combat. - updated filters.txt, they weren't matching a lot of stuff from 44.12.